The Mt. 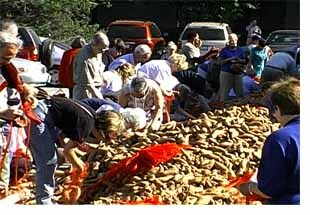 Vernon United Methodist Church sponsors three or four Society of St. Andrew potato drops at their church each year to help feed the hungry in their community. To raise money for the transportation costs of the potatoes they have various fund raisers like the potato soup supper shown in this MissionCast. Joe Bartelsmeyer, retired from the Office of Creative Ministries staff, started the potato drop ministry in Missouri and is a member of the Mt. Vernon UMC. You can contact Joe through the Mt. Vernon United Methodist Church by calling 417-466-2459. Thanks to Steve Cusumono for producing this MissionCast. Also check out the list of MissionCasts at the right indexed by category.Instructions for downloading videos to your computer:Â Right click on one of the links above and select â€œsave link asâ€ or â€œsave file asâ€ then tell your computer where you want to save the file and click OK.
Students from campus ministry groups all over the country spent their spring break serving people.Â Wesley Foundation students from Missouri served rebuilding homes in Louiaiana.Â MissionCast this week follows a group of students from Virgina who spent spring break in Florida gleaning food for the hungry, through the Society of St. Andrew. 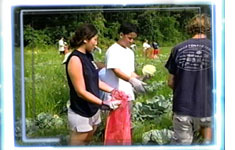 Jeff Baker, at the Office of Creative Ministries, serves as the Missouri Hunger Advocate for the Society of St. Andrew.Â Contact Jeff to find out how to set up a gleaning project for your congregation. Tons of food that would otherwise be thrown away are gleaned each year to make their way to the tables of hungry men, women and children.Â For information contact Jeff Baker at 573-474-7155 or email him at baker@umocm.com. The Society of St. Andrew provides food for the hungry of America at about a penny per serving.Â They do this byÂ making food available that wouldÂ otherwise be thrown away.Â In Missouri many gleaning projectes and potatoe drops are organzied each year through theÂ Joe Bartelsmeyer at the Office of Creative Ministries.Â To learn more about what you can do call Joe at 573-474-7155 or email him at bartelsmeyer@umocm.com.Â To view MissionCast click on the pictureÂ to the left or click on one of the links below.